One of my favorite shows growing up was “Quantum Leap.” In fact, give me pretty much any TV show or movie that centers on alternate reality, and I’m instantly hooked. We get used to the world we live in and the way things are, so it’s cool to see how the world could be in a different reality. If only we had some sort of portal to take us there. Surely, if you’ve been paying attention to college football lately, you’ve heard about the “transfer portal.” No, it’s not a cool sci-fi movie starring Nicolas Cage — but rather something that very well could pave the way to an alternate reality in the sport. Pop culture hokiness aside, make no mistake, the transfer portal, which is new this year, is something that’s here to stay. And it will change the future of college football. It already has, particularly at Penn State. As I was writing about all this during the snowstorm Saturday afternoon, news broke that yet another Nittany Lion is transferring. Linebacker Jarvis Miller is entering the transfer portal, becoming the 12th Penn State player to decide to transfer since the regular season ended. Twelve players looking to transfer. Just think about that. It’s a staggering number. Even after the scandal fallout and subsequent NCAA sanctions seven years ago, Penn State lost only nine players to transfer in the initial wave. It’s possible that not all the current transfer possibilities will leave. Just entering the portal doesn’t guarantee someone is departing, only that he can now be contacted by other schools and coaches. How does Penn State stack up with other major programs in the number of players in the transfer portal? We just don’t know. The portal is off limits to the media, and the only way to find out if a name is in there is if a source (coach or player) leaks it. It’s safe to say, though, that many big-time programs have numerous players in the portal. Whether they have more or even close to the number that Penn State has is unknown. Some are calling this the beginning of free agency in college football. True, players have always been able to transfer, having to sit out a year if they don’t have a degree, or play immediately as a graduate student. But nowadays, more and more college kids are impatient and want to play sooner, they think the grass is greener on the other side, they see that coaches are leaving left and right and figure they should try it, too, and they are beginning to understand the clout they have in the whole process. That last part is something college athletes generally have never had. When it comes to Penn State, what many fans want to know is: What the heck’s going on with so many guys leaving? After that, questions about why all of this is happening now and whether coach James Franklin has lost some level of control over the program are inevitable. The bottom line: This is a complicated issue that doesn’t have one simple answer. We’re talking about young people here, and young people make decisions for many reasons. Some players transferring just want to get closer to home, others have family issues. Each situation has to be taken on a case-by-case basis. Penn State has recruited very well, so one answer is many of these players came to campus and believed they would get a lot of chances to play, only to find out the competition is too stiff and their opportunities are more limited than they’d hoped. Most of the players looking to transfer are backups (receiver Juwan Johnson is the notable exception). So, the good news is, there’s no need to panic. The sky isn’t falling because these particular 12 guys are leaving (or may leave). But there is bad news. 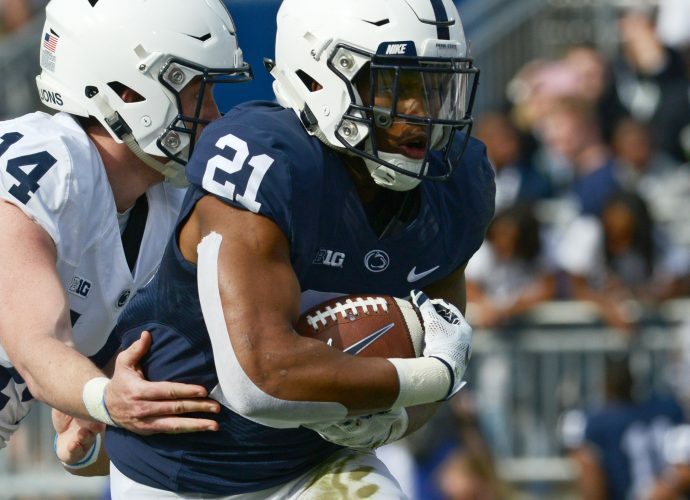 Taking into account the 21 players who either used up all their eligibility or underclassmen who chose not to return for their final year, plus five who declared early for the draft, plus all the transfer guys, and Penn State could be losing as many as 35 players from last year’s team. That’s a huge number of holes to fill in your program. Not just the starters, but the players who had a good bit of experience and provided solid depth, both in games and in practice. That last part is key to me with regard to some of the transfers. Even if they aren’t starters, you cannot lose sight of their value in practice every day, pushing the starters to get better and working themselves into position to be able to contribute if need be on a given Saturday. Many of the guys leaving played on special teams. While Penn State’s special teams were terrible, by and large, this past season, it’s not a good thing to lose so many guys who have at least gotten on the field. Fellow Penn State beat writer Greg Pickel of PennLive did good work this past week going through the roster and providing an updated scholarship count for next season. If all transfer possibilities leave, the Lions would have only 74 scholarship guys, including incoming freshmen. That leaves 11 open scholarships. Franklin will cut into that number with some recruits, but he’s not going to sign 11 more high school players between now and signing day part two next month. The signing day part bring ups an interesting element. Now that we have an early signing day in December, many programs are expecting to sign 80-90 percent of their class then. But if so many players are going to be transferring after the season, which seems to be the likelihood, then it will leave coaches scrambling to fill holes they didn’t expect to have prior to the February signing day. Or, they could bring in transfers themselves. Because of course, if we are now in an era when many more players are going to transfer, it stands to reason that teams will have to start bringing in more transfers to fill gaps. The big question, though, is whether Penn State wants to go that route very often. Traditionally, Penn State has never brought in a bunch of transfers. Joe Paterno didn’t believe it was a good way to build or sustain the program, and let’s face it, Penn State’s very high academic standards can hinder some transfer situations. One concern with bringing in too many transfers is how it can disrupt overall team and program chemistry. You want to build your program from the ground up, with younger guys understanding they need to work hard so that they can push for playing time, and bringing in too many hired-gun upperclassmen as transfers can have a negative impact. Like it or not, we have entered an alternate reality with regards to how players view themselves in college football and how willing they are to move around in order to meet their own personal goals. Whether this whole transfer portal phenomenon is a fad or truly the start of a revolution in the sport will be fascinating to watch in the coming years.